Recycling costs are going up for Chittenden County residents as the region's municipal waste authority adjusts to a sharp decline in the sale value of paper recyclables. The Chittenden Solid Waste District increased the tipping fee — the charge for haulers who bring recycling to its Williston facility — on May 1. Another increase is likely soon, possibly in the next few months. Some haulers have already decided to pass the increase on to consumers. The hikes come in response to the plummeting value of paper recyclables as China, which had been the world's largest consumer of recycling, ushers in strict new environmental regulations and stops accepting most mixed paper. The shift has put recycling programs around Europe and the U.S. into disarray. Vermont is also feeling the pinch. "It's taken such a dramatic hit, and we need to make up that revenue,” said Sarah Reeves, general manager of the Chittenden Solid Waste District, the governmental organization that oversees waste management for Burlington and 17 other communities. Last summer, the waste district could sell mixed paper for about $75 a ton. Now, it must pay about $57 a ton to recycling brokers for the same mishmash of used office paper, cardboard, newsprint and other paper products that come from consumers' blue bins and recycling carts. 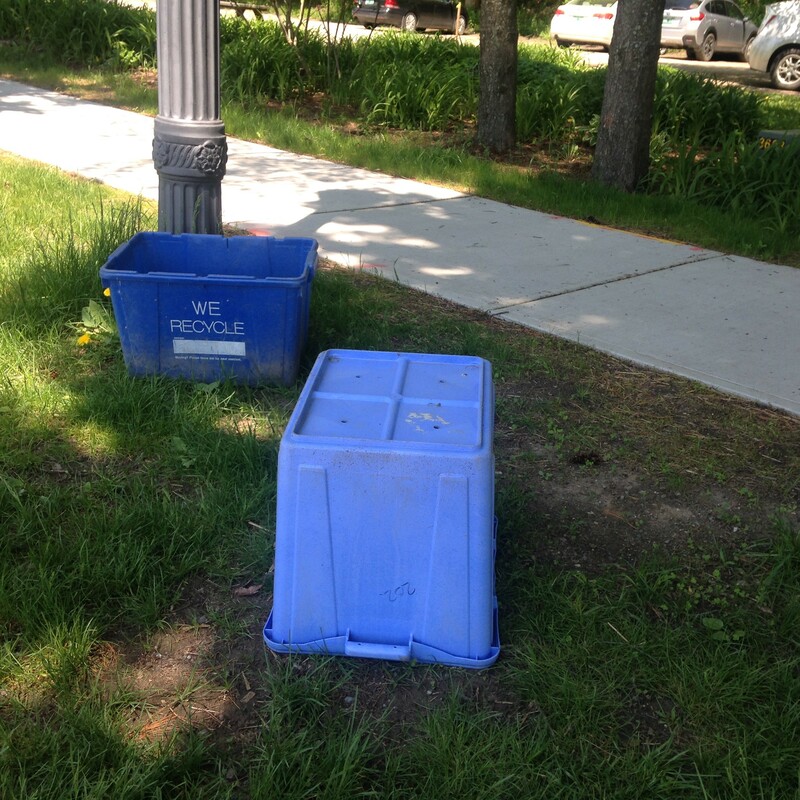 To deal with the price drop, the waste district increased tipping fees May 1 from $21 a ton (for all haulers) to $25 for haulers of "in-district" (Chittenden County) recyclables and $50 a ton for haulers of "out-of-district" recyclables. The next increase is likely to hit Chittenden County harder, and possibly bring its tipping fee up to the $50-a-ton mark, according to Reeves. The final increase amounts will be decided by the waste district board in the next few weeks, she added. Reeves anticipates that private haulers will pass the increases onto customers who pay them to take away trash or recycling. “That’s generally what happens," she said. Myers Container Service, based in Colchester, increased fees 6 percent effective June 1. The standard monthly tab for weekly trash and recycling pick-up will go from $42.33 to $44.88. “I know a number of haulers have already done the same for the June billing,'' said Joe Sinagra, sustainability director at Myers. He added that higher tipping fees prompted the hike. Burlington, which has curbside, city-run recycling pickup, is preparing for substantially higher costs for "tipping" at the waste district facility. Chapin Spencer, director of Burlington Public Works, said the city wants to increase its solid waste generation tax to cover the tab. "The severely depressed mixed-paper commodity markets led our partner CSWD to recently increase their tip fee from $21 to $25 per ton and CSWD has informed us that a much more significant increase is coming imminently," Spencer wrote in an email to Seven Days. "To cover these increased costs, we unfortunately need to adjust the solid waste generation tax that funds the program." The tax is raised in an indirect fashion. Although the city collects recycling, it does not collect trash. That's left up to residents to arrange. Burlington then levies the solid waste tax on private haulers who contract with residents for trash pickup. Right now, the tax is $3.70 per month, per residential unit. Spencer's department is asking the city council to increase the fee to $4.20. Under state law, Vermonters are required to recycle most paper, glass and plastic. About 37 percent of the material brought to CWSD is mixed paper, according to Reeves. In the past, the junk mail from Burlington and used paper towels from Shelburne that went into household blue bins could well have ended up at paper mills in China. The country gobbled up recyclables for many years as its industrial economy surged. But not all of the material that arrived could actually be recycled, creating an enormous trash problem for China. Hazardous materials mixed in with recycling also created health and environmental problems, as well as growing public opposition in China to being the "world's trash can." China implemented new standards January 1 for mixed paper that are so strict that almost no recycling center anywhere can meet them, Reeves said. Some of Vermont's paper is now likely going to paper mills in India, Korea and Thailand, she said. But Reeves acknowledged that it's difficult to know exactly where it ends up. She believes the paper is still recycled, in keeping with the goal of the program. However, Reeves worries that the entire market for paper recycling could tank.